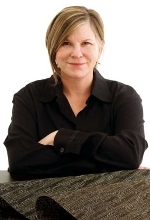 New York based designer Sandy Chilewich launched her namesake design studio, Chilewich, in 1997. Previously, Sandy was a primary force at HUE, the hosiery company she co-founded with Kathy Moskal in 1978. HUE was credited with revolutionizing the legwear market with its innovations in design, packaging and merchandising. The company was sold in 1991, and Sandy stayed on as co-president until 1994. The brand continues to thrive today while Sandy continues to explore new, creative uses and designs for textiles. Sandy introduced the highly successful RayBowl™, her studio’s first effort, in 1997. In a quest for other suitable fabrics to incorporate into the RayBowl, she stumbled upon woven vinyl and fell in love with what she believed was a completely underutilized textile. This discovery set the tone for her current, wide line of home textile products, ranging from critically lauded placemats, to pet mats and even iPhone cases. The entire line remains manufactured almost exclusively inside the US. There are no products from this manufacturer currently uploaded to our website. This does not mean that we do not stock or sell any products from this manufacturer. Please call us at (480) 483-2044 to find out what products are available to purchase in store or by phone.